Not only will they feel more independent, but it allows you to take the night off from cooking occasionally. 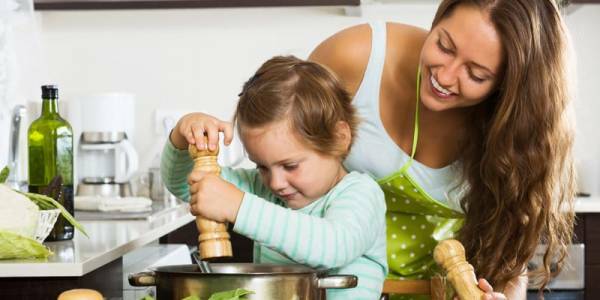 As a plus, children who are able to cook for themselves often develop a more advanced palate. You might notice your child growing adventurous and being more open to trying new things. While they won’t be searing filet mignons anytime soon, there are plenty of easy-to-make meals that will make your child feel like a master chef. Here are some easy recipes for kids to make by themselves for dinner. Your kid will love making these small, personal pizzas in the toaster oven. Not only are they a breeze to make, but they can also be easily customized. Perfect for picky eaters! Spread a layer of pizza tomato sauce onto each piece of pita bread. Pile it high with toppings like bell pepper, beef, mushrooms, and zucchini. Encourage them to get creative with combos like ham and pineapple, or barbeque sauce and chicken. Sprinkle the top with mozzarella cheese, then pop it in a preheated toaster oven at 400 degrees Fahrenheit. It’s ready once the cheese is nice and melted. Any day can be Taco Tuesday with this kid chef recipe for bean-and-cheese tacos. Like the pita bread pizza, tacos are easily customizable to suit your child’s tastes. Place the taco shells in the toaster oven and bake at 325 degrees until they’re crisp. As they’re toasting, combine one can of pinto beans and ¾ cup of salsa in a microwave-proof bowl. Warm it on high for 1 to 2 minutes, or until hot. Divide the bean mixture among the taco shells, then top with lettuce, cheese, salsa, sour cream and any other desired toppings. What’s an easy way to get kids to eat their vegetables? Pile them onto a baked potato! Potatoes are easy to store in bulk, making this a recipe that kids can make anytime. Show them how to scrub the potatoes well to remove any dirt or sprouts. Once washed, carefully pierce each potato several times with a fork. Microwave it on high for 12 to 15 minutes, or until it can easily be pierced to the center with a fork. Once tender, transfer the potatoes to a bowl and cover with foil to keep it warm. Combine a package of frozen broccoli with two tablespoons of butter, ½ teaspoon of salt and ¼ teaspoon of pepper in a microwave-safe bowl. Microwave it for six minutes, stirring halfway through. Split the potatoes carefully, then add the broccoli mixture and top with sour cream. If desired, sprinkle with shredded cheese or additional salt and pepper. A little coaching and creativity pair perfectly to help get your kids into the kitchen and on the road to a love of cooking. Hire Coast Chef for your worry free children party and enjoy the time with your kids. We will prepare your kids favorite meals. Call us at (619) 304-0450 and let’s talk about your event. Our caterers will create a memorable celebration for your children with our delicious food.